Al Riyami N, Ahmed A,Tanzeem S, Abdul-Latif M. Fetal Amelia: A Case Report. Oman Med J 2012 Jan; 27(1):54-55. Keywords: Amelia; Congenital; Limb defects; Sporadic; Rare. Amelia, defined as the complete absence of the skeletal parts of a limb, is generally thought to be a sporadic anomaly.1 It can present as an isolated defect or with associated malformations, particularly abdominal wall and renal anomalies.2-4 Teratogens such as thalidomide, alcohol, vascular compromise by amniotic bands or other causes, and maternal diabetes have been reported to cause this severe limb deficiency.5-8 Amelia is a rare condition with an incidence range from 0.053 to 0.095 in 10,000 live births.9,10 The extreme rarity of this congenital anomaly has stimulated this report on a new case presented at Sultan Qaboos University Hospital. Figure 1: The baby gram. Figure 2: External examination of the stillborn baby. In the current case; the prenatal ultrasound did not reveal gross anomalies apart from mild bilateral renal pelvis dilatation and the presence of a tiny stomach. 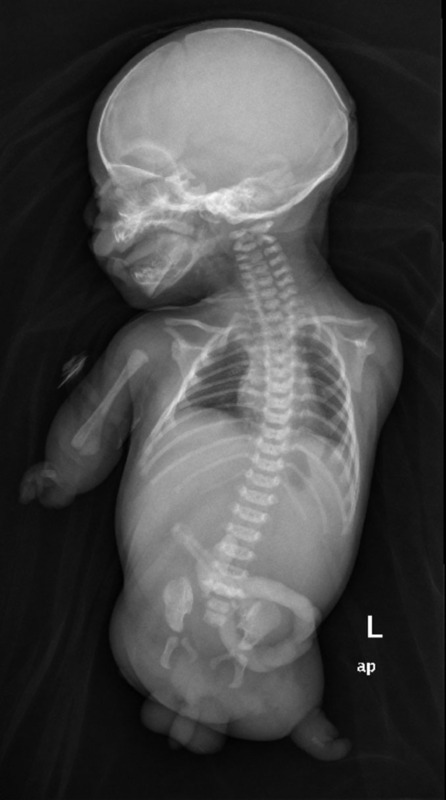 Absent bowel gas noted on the skeletal survey after birth may have indicated a form of esophageal atresia. Infants with Amelia only appear to have good prognosis; whereas most newborns with Amelia associated with organ malformation die in the first year of life. As organ malformations have been reported to be frequently associated with cases of Amelia,12 autopsy findings would have been helpful; but unfortunately, pathological examination and chromosomal analysis were refused by the parents. The current evidence on this topic is uncertain and the exact categorization of the condition is made more difficult by the absence of autopsy. The possibility of the recurrence of amelia has been documented in only a few families.13-15 In this case, pregnancy and family history were non-contributory factors regarding genetic or teratogenic causes; maternal infection also appears to be unlikely. It is difficult to progress further in the etiology of this case. These parents were counseled for a low recurrence rate and advised to have an early anomaly scan in future pregnancies. Prenatal diagnosis including detailed ultrasound and amniocentesis play a major role in counseling parents with fetal anomalies. 1. Lenz W. Genetics and limb deficiencies. Clin Orthop Relat Res 1980 May;(148):9-17. 2. Froster-Iskenius UG, Baird PA. Amelia: incidence and associated defects in a large population. Teratology 1990 Jan;41(1):23-31. 3. Evans JA, Vitez M, Czeizel A. Patterns of acrorenal malformation associations. Am J Med Genet 1992 Nov;44(4):413-419. 4. Mastroiacovo P, Källén B, Knudsen LB, Lancaster PA, Castilla EE, Mutchinick O, et al. Absence of limbs and gross body wall defects: an epidemiological study of related rare malformation conditions. Teratology 1992 Nov;46(5):455-464. 5. Smithells RW, Newman CG. Recognition of thalidomide defects. J Med Genet 1992 Oct;29(10):716-723. 6. Pauli RM, Feldman PF. Major limb malformations following intrauterine exposure to ethanol: two additional cases and literature review. Teratology 1986 Jun;33(3):273-280. 7. Van Allen MI, Curry C, Walden CE, Gallagher L, Patten RM. Limb-body wall complex: II. Limb and spine defects. Am J Med Genet 1987 Nov;28(3):549-565. 8. Bruyere HJ Jr, Viseskul C, Opitz JM, Langer LO Jr, Ishikawa S, Gilbert EF. A fetus with upper limb amelia, “caudal regression” and Dandy-Walker defect with an insulin-dependent diabetic mother. Eur J Pediatr 1980 Aug;134(2):139-143. 9. Bod M, Czeizel A, Lenz W. Incidence at birth of different types of limb reduction abnormalities in Hungary 1975-1977. Hum Genet 1983;65(1):27-33. 10. Källén B, Rahmani TM, Winberg J. Infants with congenital limb reduction registered in the Swedish Register of Congenital Malformations. Teratology 1984 Feb;29(1):73-85. 11. Morey MA, Higgins RR. Ectro-amelia syndrome associated with an interstitial deletion of 7q. Am J Med Genet 1990 Jan;35(1):95-99. 12. Song SY, Chi JG. Tri-amelia and phocomelia with multiple malformations resembling Roberts syndrome in a fetus: is it a variant or a new syndrome? Clin Genet 1996 Dec;50(6):502-504. 13. Zimmer EZ, Taub E, Sova Y, Divon MY, Pery M, Peretz BA. Tetra-amelia with multiple malformations in six male fetuses of one kindred. Eur J Pediatr 1985 Nov;144(4):412-41. 14. Gershoni-Baruch R, Drugan A, Bronshtein M, Zimmer EZ. Roberts syndrome or “X-linked amelia”? Am J Med Genet 1990 Dec;37(4):569-572. 15. Rodríguez JI, Palacios J, Urioste M, Rodríguez-Peralto JL. Tetra-phocomelia with multiple malformations: X-linked amelia, or Roberts syndrome, or DK-phocomelia syndrome? Am J Med Genet 1992 Jun;43(3):630-632.